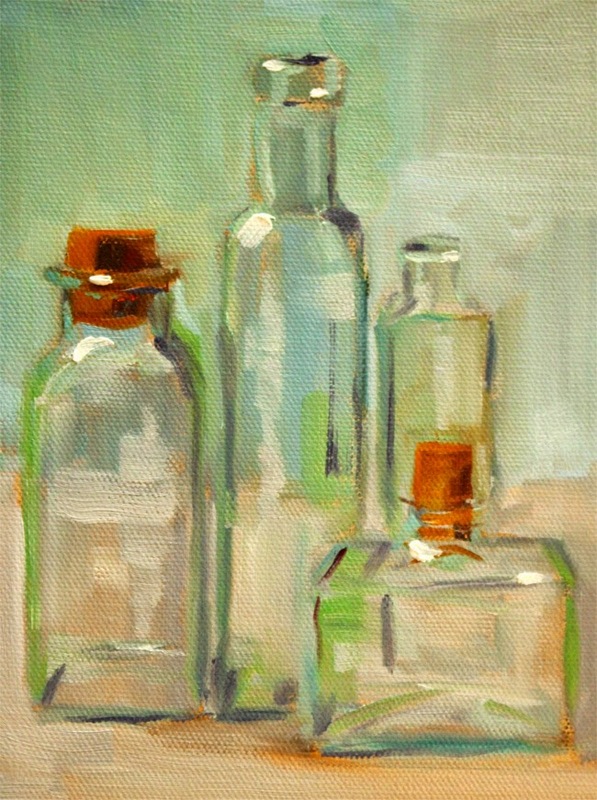 A collection of glass bottles is the focus of this still life oil painting. It was painted from life. It helps to see how the light reflects as the glass is recreated on canvas. In my last post, I discussed the practice of using the rules of color and light to paint little still life paintings. 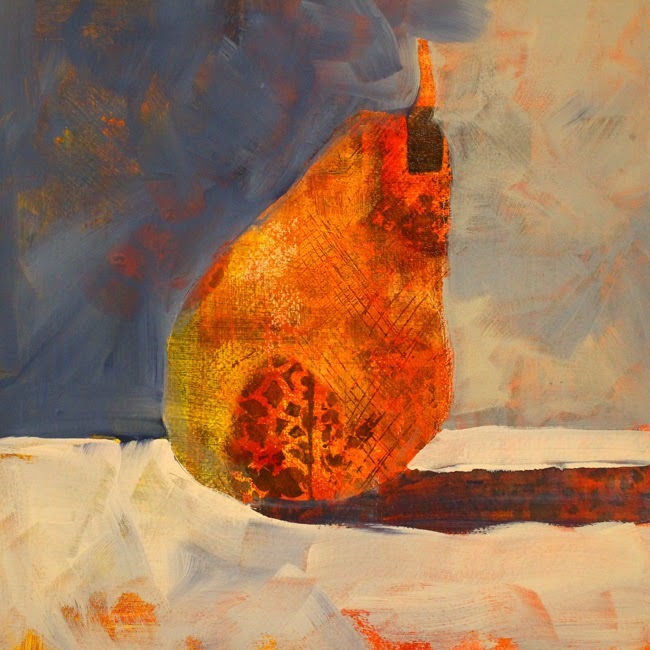 I did not have a reference for my example, but used what I knew about the subject to create the painting of an orange bell pepper. Painting glass is different. Light spews in so many directions. Reflections on glass depend on so many variables, that I find it difficult to create the sensation without an actual reference. The color of the glass, the thickness of the glass, and the direction of the light are trickier when it comes to painting glass. This original 6x8 inch oil painting is for sale in my Etsy Shop along with some of my other original still life paintings. At this point, it is not available as a reproduction. I hope you will stop by and view some of my other small format paintings. This painting can be viewed here. When painting still life, I've always felt it was necessary to have a reference. The best references are those that I buy at the grocery store or farmer's market and bring home. Or are they? Recently I've been giving myself a little test. I've worked on a series of fruit and vegetable paintings. Some I have painted from a live reference and some from my mind's eye using the rules of light, shadow, and color. The question is whether or not there is truly a difference. What do you think? 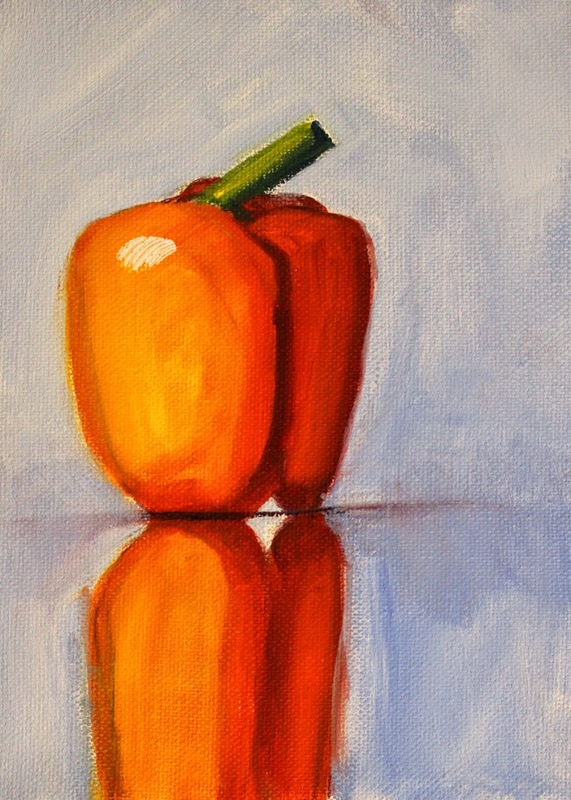 Was this orange pepper painted from reference or memory? I'll let you ponder that and will give the answer in my next blog update, so stay tuned. The original 6x8 inch oil painting is for sale in my Etsy shop. 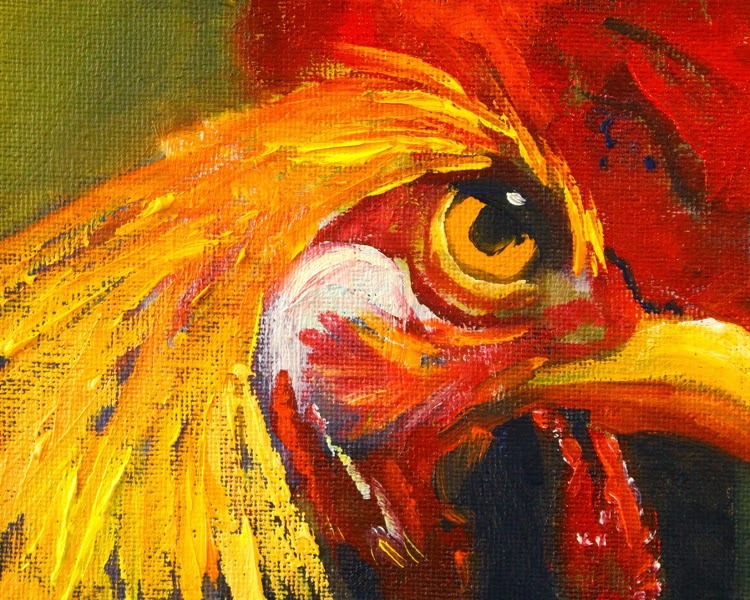 It was created with professional grade oil paints on a stretched canvas. You can view it here. It is also available in larger sizes as a reproduction on archival paper or canvas from my website here. Click here for sizes and prices. 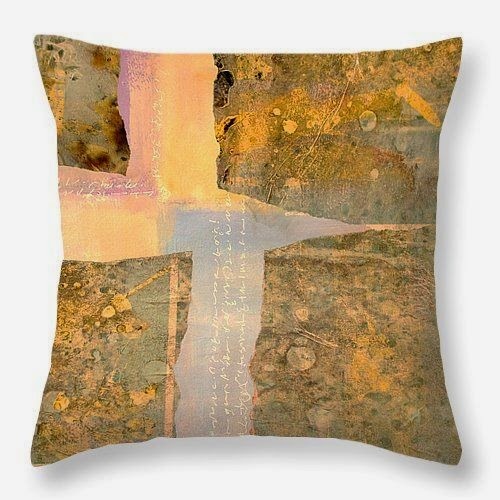 You can also make it into a fun little throw pillow. Follow this link for sizes and prices of throw pillows. Recently I've been working on a series of small bird portraits. I always start with painting the eyes. If I can get the eyes right, the rest of the creature seems to come together much easier. This guy is strong and determined. He's in charge and wants everyone to know it. As I get the paintings in this series photographed and uploaded, the originals will be listed in my Etsy shop in the Birds and Animals gallery. Most are 4x5 an 4x6 inches in size, created on canvas panels with professional grade oil paints. If I can get decent photographs, I will also sell them as reproductions here. It is a challenge to photograph small paintings and have them suitable as reproductions, so many of them may exist in original form only. When they are gone, they're gone, original one of a kind small format art. How cool is that? If you'd like to see all of the work I have available for reproduction, please stop by my gallery and shop here. Sunday is a pastel day, easy, comfortable, devoid of stress, a sleep in, read the paper kind of day. 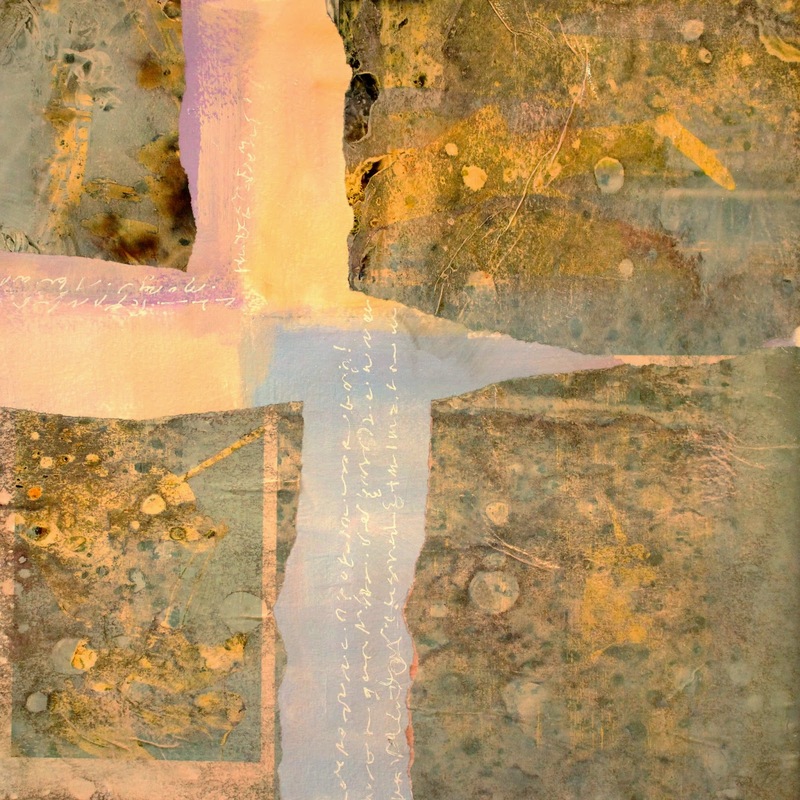 This mixed media contemporary abstract design is my Sunday morning. The stress of the weekdays has broken away revealing a soft inner core, pastels, tints, not the grating of the day to day grind. That's what inspired this original collage work that was developed on 12x12 inch watercolor paper using acrylic paints, ink, and torn paper. 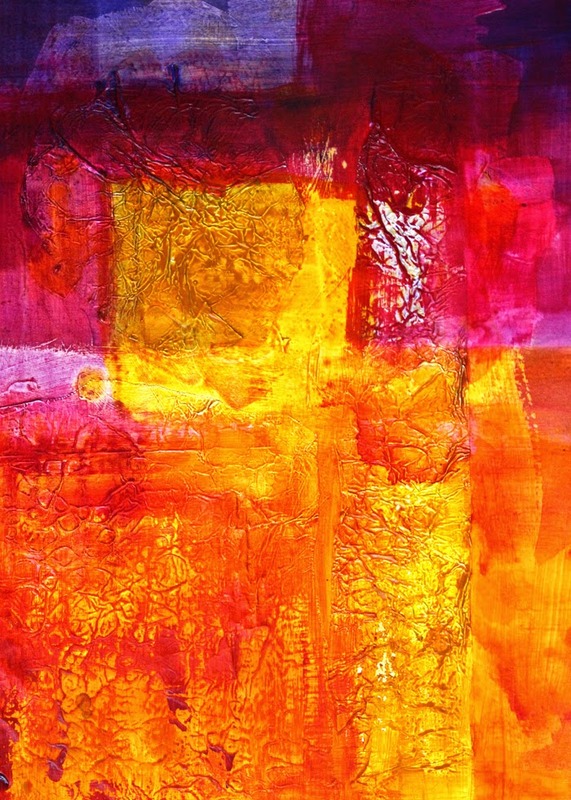 Reproductions of the image are available in the abstract gallery of my website. To add to the fun, I discovered it looks great as a pillow, too. Click here for prints and here for pillows. How fun is that? The weather in February has been awful. Snow in the East and rain in the West. In the Pacific Northwest where I live it has been day after day of drizzling liquid. To combat the dreariness of it, I have been painting oranges. They are bright and sunny and I get to eat them when the day is done. 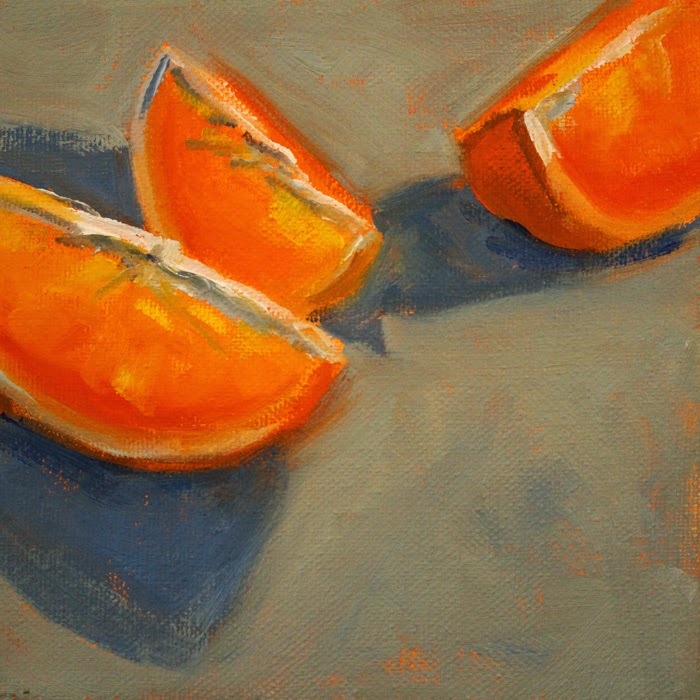 This 6x6 inch still life of sliced oranges is one of the recent series of tropical fruit paintings that has served me well during the gray gloom of the month. The original can be purchased here. Visit the tropical fruit section of my Etsy shop to view more. These little jewels are not available as reproductions, but I hope they will brighten your day as they have mine. Combining some contemporary techniques with a traditional still life is what today's posting is all about. I began this acrylic painting with layers of paint and pattern, using stencils, stamps, and a paintbrush, I created a textured underpainting. Working intuitively the design took on a life of its own. When I reached the point where it felt like it was finished, I created the silhouette of a simple pear still life over the underlying design. It turned out to be a fun combination of old and new, abstract and representational, and my love of both was satisfied by the completion of the painting. The original was created on a 12x12 inch sheet of watercolor paper with acrylic paints. Giclee reproductions are available from my website here. The square format painting can be ordered in a variety of square format sizes, on paper, or on stretched canvas, one of my favorites when 1.5 inch stretcher bars are used. Very cool for the kitchen. Playing with texture and color was the order of today's effort. I used acrylic mediums, foil, and paint as my playground. It was a fun experiment that achieved a design worth keeping. The original work was created on 11x14 inch paper. Reproductions are available in a variety of sizes from my website. Click here for details about this work.